They are the first company we met thirty years ago, and they have really high standards. We have a long work history with them. The family has been passed down from generation to generation. They do excellent quality work. They have fair prices, and they know what they are doing. They were always on time, and they did what they said they would do. I wrote them a letter, because I was so pleased with the people they sent. I really felt that they went above and beyond, and they stayed longer than they originally planned to. They did a great job. They were really good. They were so professional, everything was nicely done, and they cleaned up after themselves. They were just wonderful. I've recommended them to a couple of people. They don't slack off on the job, and they give you your money's worth. There were two guys on the job, and they both worked very hard. As a matter of fact, I'm planning to use their company again. They were fair, and they worked very hard. They're wonderful. I would recommend them to anybody. 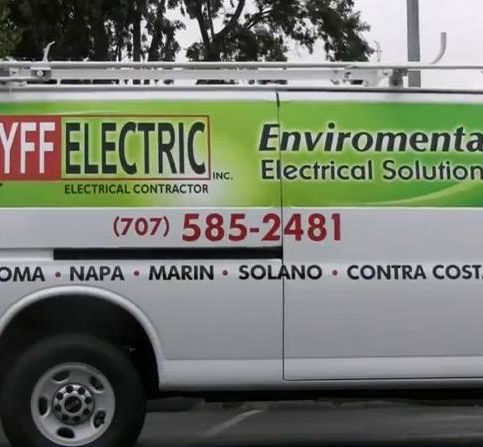 Reyff Electric, Inc. has been providing electrical construction and service for Marin, Sonoma, Solano, and Napa Counties since 1980. The family-owned and operated company was established by Ray Reyff Sr., based on hard work and integrity. These values carried through to his eldest son, Ray Reyff Jr., who now owns and operates all branches. 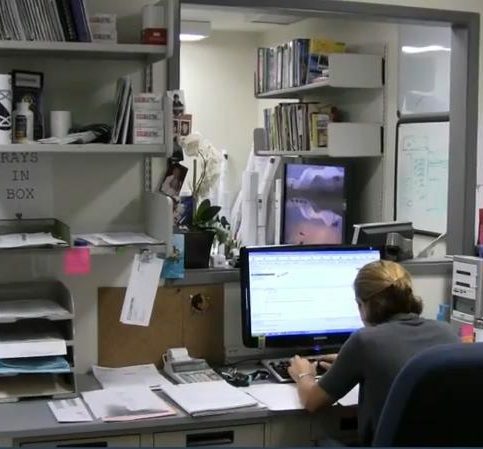 Reyff Electric’s office support staff promptly returns calls during regular business hours and schedules all appointments to best accommodate customers. The company’s service technicians are scheduled within two-hour windows and may offer to call 15 minutes before their arrival. 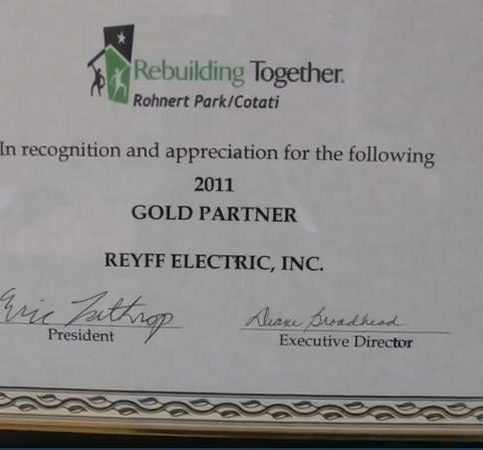 Reyff Electric’s residential electrical services include (but are not limited to) spa and hot tub hookups, troubleshooting and rewiring, panel and breaker upgrades, cable DSL networking, motion detectors and flood lighting, audio and visual installations, ballast and lamp replacements, smoke detector repairs and installations, appliance hookups, can lighting and dimmer controls, bath and ceiling fan installations, and much more. DIAMOND CERTIFIED RESEARCHED CAPABILITIES ON Reyff Electric, Inc.
Company Name: Reyff Electric, Inc.
DIAMOND CERTIFIED RESEARCHED ARTICLES ON Reyff Electric, Inc.
Few electrical contractors earn the prestigious Diamond Certified award, which means they’ve been independently rated Highest in Quality. 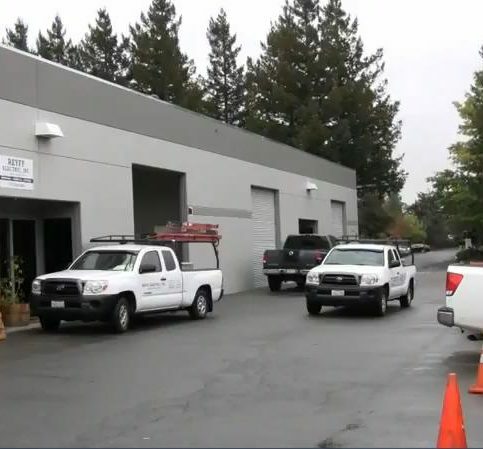 Even fewer can also claim more than 30 years of industry experience and family members running key positions within the company, but that’s exactly the case for Reyff Electric, Inc.
Reyff Electric provides a full range of electrical services for residential, industrial and commercial clients in Marin, Sonoma, Solano and Napa Counties. For residential customers, the company installs electrical systems in new homes; maintains and upgrades existing electrical systems; sets up spas and hot tubs; upgrades panels and breakers; and installs attics, exhaust fans, motion detectors, flood lighting and more. 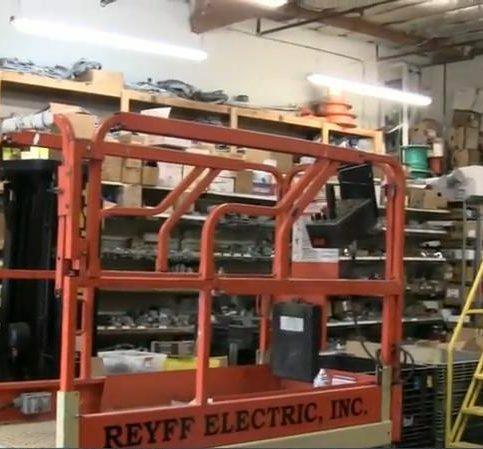 On the commercial side, Reyff Electric offers its services to a wide variety of businesses and has developed a particular expertise for working on restaurant electrical systems. It also uses a boom truck to install and maintain parking lot lighting and exterior signs. Know how your outlets are wired. Understanding a little more about the outlets in your home can help you use them safely, conserve energy and troubleshoot potential problems. Most modern outlets come in pairs (known as a “duplex receptacle”) and are generally rated at 15 or 20 amps and 120 volts. It’s important to know your outlet’s rating: If you have to replace a receptacle, you should always install an exact duplicate. Understand fuses. Fuses are safety measures designed to keep devices and appliances from drawing too much current from your electrical system, which can create a dangerous situation. 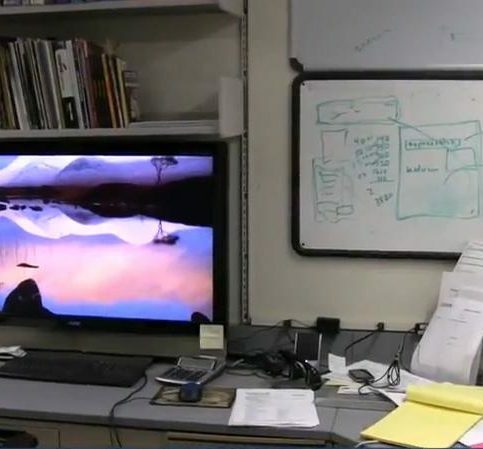 When the current flowing through a fuse is greater than it was designed to withstand, the metal melts, interrupts the circuit and stops the flow of electricity. In this way, it acts like a kill switch. 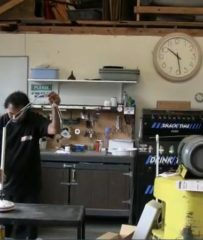 When a fuse blows, it needs to be replaced. For the sake of safety and proper functioning of your electrical system, always use an identical replacement for the blown fuse. The three basic types of fuses are plug, time-delay and cartridge. The wrong type won’t fit in place of the old fuse, but you also have to pay attention to the amp rating of the fuse being replaced. Never replace a fuse with one that bears a higher amp rating. Conserve electricity. Routinely maintaining your appliances can go a long way toward reducing the amount of energy your family uses on a daily basis. For example, any device involved in the heating, cooling and ventilation of your home should be kept clean and in good repair. Make sure to regularly clean and replace heater and air conditioner filters. Keep the furnace room free of debris that can be sucked up into the fan. Clean ventilation ducts consistently to prevent them from becoming clogged. You can do a lot of these smaller tasks yourself, but you should always call a professional for larger maintenance tasks. The upfront expense may give you pause, but consider it an investment in your home and lowering your energy bills. You should also have your electrical system inspected on a regular basis so potential issues can be stopped before they become problematic. Q: What’s your response time? A: We always do our best to answer the phone, but if you don’t reach someone right away, we’ll call you back as soon as possible. For emergencies, we can usually make a service call that same day. For non-emergencies, we can schedule an appointment within the week. Q: Are your technicians on time? A: Yes. When we schedule an appointment, we’ll give a two-hour window and call 15 minutes before we arrive. If we think we’ll miss that window because of an earlier call taking longer than expected or heavy traffic, we’ll call and let you know. SELECTED PHOTOS FROM Reyff Electric, Inc.
Chet Heenan is a longtime veteran of the electrical industry and service manager of Reyff Electric, Inc., a Diamond Certified company since 2011. He can be reached at (415) 508-5638 or by email. Outside of work, Chet spends his time outside of work engaged in hobbies like cooking and reading. “I’m not a professional chef anymore, but I still do a lot of cooking to keep my skills sharp,” he says. “I’m also an avid reader of all types of books. To me, it doesn’t really matter what a book is about as long as it’s well-written.” When he’s not preparing food or absorbed in a novel, Chet enjoys hanging out with family and going on walks with his Australian Shepherd, Sadie. A: Happy Dog in Sonoma. It’s kind of a guilty pleasure, but if you ask me, they make the best double cheeseburger anywhere. A: “The Stand” by Stephen King. A double-lugged circuit breaker means there are two wires (circuits) going into a single breaker. This is an example of improper wiring, typically done as an attempt to fit wires where space is limited. When a breaker is double-lugged, it can result in over-feeding of the wires, which can cause the breaker to trip prematurely. In contrast, a panel that’s wired correctly will have a designated breaker for each individual wire. Different sizes of electrical wires correspond to specific breaker sizes, so when wires and breakers are incorrectly matched, it can lead to problems. For example, installing a size 14 wire into a size 20 amp breaker may seem like a good way to gain some additional power, but this will actually cause the wire to break down and short out prematurely. Just as with double-lugged breakers, it’s common for neutral wires to be incorrectly paired up when space is limited. 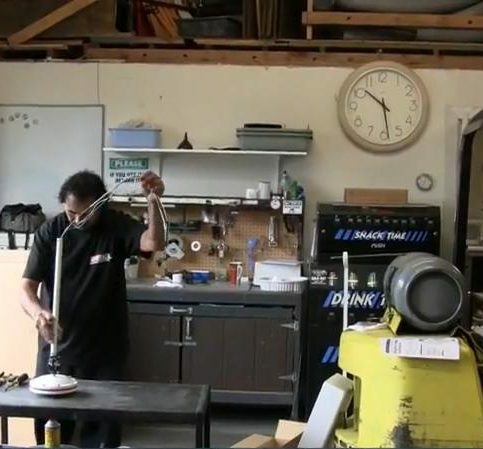 However, each individual wire should have its own space on the neutral bar. There are approved methods to create more space for neutral wires without resorting to double-lugging. A sloppy wiring job doesn’t just look bad, it also makes it difficult for you or your electrician to identify which wires go where. To avoid this, wires should be secured with zip ties to maintain a neat appearance. Behind your panel, you’ll find the meter jaws, which are exterior connectors that send electricity from the panel into your home. Over time, a panel’s meter jaws can become loose, which can lead to problems like overheating and arcing. If left unresolved, this issue will eventually lead to power loss. Romex is a composite cable that consists of several electrical wires bundled together by a plastic sheathing. To preserve Romex cables, protection like bushings and connectors should be in place at the holes where the cables exit the panel. Since these holes in the panel’s metallic box can be sharp, this protection will prevent deterioration from abrasion over time. 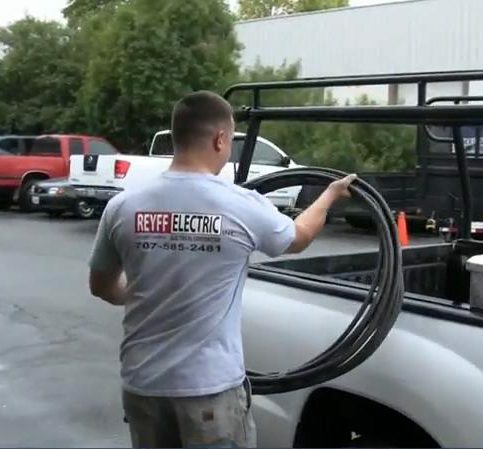 Grounding is a crucial aspect of any modern electrical system. However, it’s not uncommon for electricians to find panels and wiring that were installed before grounding was required by code, so make sure your panel contains proper grounding. ROHNERT PARK — Host, Sarah Rutan: Due to the complexity of your home’s electrical panel, it’s important to pay close attention to critical aspects like wiring. 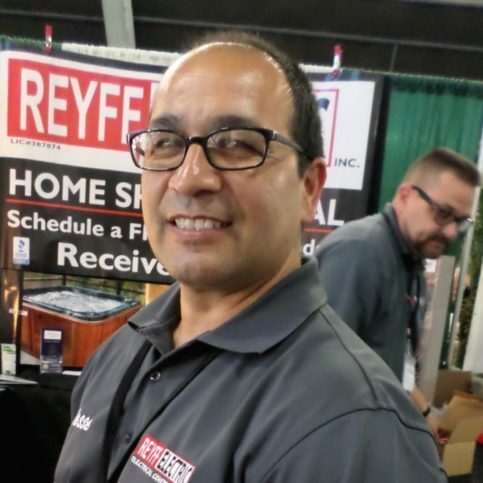 To learn more, we’re in Rohnert Park with Estevan Alvarez of Reyff Electric, speaking on behalf of Diamond Certified Expert Contributor Chet Heenan. 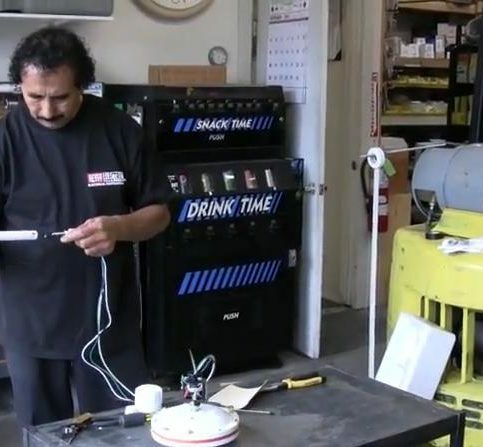 Estevan Alvarez: All right, so today we’re going to talk about proper wiring in your panel for safety. This is important because you can have an electrician or a handyman come to your home and do some wiring that will be done improperly and it can be a safety issue for you and your home. So, one of the issues we face in older panels is a double lugged breaker and what a double lugged breaker is when you have two circuits going into one circuit breaker. This is a problem because this can cause over feeding of your wires and this can cause this breaker to trip prematurely. Another issue we can do is the wrong size wire in the breaker. This is a size 14 wire installed in a size 20 amp breaker. This wire is only rated for a certain amount of power to flow through it. Installing a large breaker to get more power out of it will cause the wire to break down prematurely and can cause it to short out or lose power. Another issue is grounding, over here you can see grounding come out of the panel, but there is no ground coming into the panel. So, you need proper grounding in your panel for safety and to protect you and your home. So, another problem here is this Romex. So, the problem here with this Romex is there is no bushing or connecter, like you see here, this is a Romex connector. This protects the Romex from any damage that can be caused by rubbing against the edge here which can cut into it causing arcing, a tripped breaker, and will cause you to have problems in your circuits. So, this is what you will find behind your meter, there are your meter jaws which allow electricity to pass through to panel and into your home. Over time these can become lose and what has happened here is heating and arcing has been going on and caused a power loss most likely in this panel. So, this is all very important because you want safe wiring done in your home. Safe wiring in your home will ensure that all your appliances, your lights, your plugs all work properly and keep you and your home safe. Diamond Certified RATINGS ON Reyff Electric, Inc.
Reyff Electric, Inc. : Average 9.3 out of 10 based on 213 unique customer surveys of customer satisfaction. They have always been our go to people that have been approved by our district manager. They are good. They are just very nice and do clean work. They are an amazing help, they were able to get us discounted rates because we are a non profit organization, so that really helped. They are professional, knowledgeable, and just good people. I like that they were able to assist with the rating, we don't have a ton of money for over headed items like this, so it really was a good thing. They ended up helping with a full rewire of our home when we remodeled it. I didn't deal much with them directly, our supervisor did, but we have not had one issue with anything electrical, and from what our main contractor said they are the best. They worked well with all the other guys, they got their part done. They got everything done in time for our sheetrock to go up, it was a very important piece of the project so we could move forward with the project. They were very helpful, I couldn't be more happy with the way our new outlets and lighting looks. They were quick and did great work. They did a great job, the owner is very straightforward about the work he is willing to do, because of the high quality he has to keep on the work. They were solid, just really solid guys. I usually don't do these surveys, but for Reyff I will, they are great. They have a good understanding of ideas and how to implement them. They were able to take my ideas I have for lighting on my property and create something I was satisfied with. This included some outdoor items in various areas that were pretty far away from our main breaker, so they were very creative. They get "10" across the board. The owner is a real deal business owner, and he cares about his customers. He also cares about the work he puts out. The front office people are amazing. They were always keeping me informed of what step they were on. I thought that they were very knowledgeable, honest, and the work was amazing. They were quick, kept within the time frame we need to move past this step. I would recommend them, let them know that we were really satisfied. They have a really knowledgeable team, they help with design feature geared towards what your usage is. I thought they were very professional, respectful of the house, and just did a great job. I think that they sometimes take on too much work. There were days they wouldn't show up, but regardless, "10's" across everything, that is how clean their work is. They are great to have them work for you. We liked the fact that they were so prompt. We have recommended them to many people, and as a matter of fact, all of our friends. It has been so long ago, and we have moved, but nothing as far as I am concerned. They are the best. That's all I have to say. I don't feel like they are trying to cheat me. They have reasonable costs. They should hire them. They are great, and the staff is friendly. I liked the workers. They are very friendly.